Morning of media coverage by our most watched regional TV station with interviews and cars shown. Actually we staged TWO separate events, one from 10 am to 2 pm in Folsom and the more major event from 4pm to 8 pm on "auto row" in Sacramento along with a classic car CruiseFest co-sponsored by the our local electric utility (SMUD) and the California Auto Museum. The California Auto Museum's annual CruiseFest moves into the future with Electric Vehicles. This year's CruiseFest will join the National Drive Electric Week to bring the Electric Cars of the past and future. See the latest EV models on display and talk with their owners about the electric drive experience. Check out the Electric Vehicle version of speed dating, test driving several models back to back - see what's similar across EVs and how they differ. 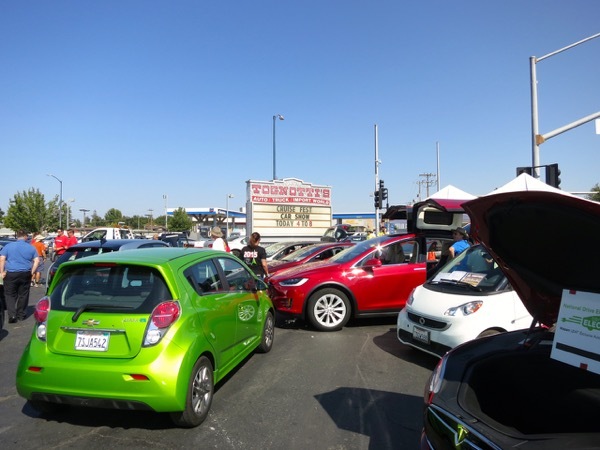 If you have an EV, let us know so you can share your experience with the community, or just show up and join the parade. Registered attendees report 193,052 electric miles driven.